I’ve recently got back into running. It’s been a while since I’ve properly run. I get to run along the waterside (although in intense humidity at the moment) watching the sky change, and light up with colour as it sets for another day. 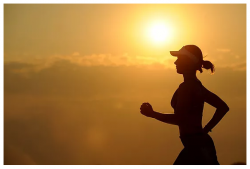 However, I find myself so easily getting caught up in thoughts around it being “too hot to go for a run”, “I’m too tired”, or “I just don’t want to”. But I prove myself wrong every. single. time! Because I do want to run, I always feel better, and I never regret it. I find myself sometimes so easily focusing on the wrong things. Take running for example. As you run, you need to be watching where you are going for many reasons. So you don’t get lost, so you can enjoy the scenery around you, and so you don’t trip and fall. But which is more important? To keep your eye on what’s right in front of you, or to your marker — your end point? When you’re running it’s important to keep your view on what’s directly in front of you, anticipating your next steps, but also on the bigger picture, the end point, the marker or what you’re running towards. Keeping your focus on both points means you avoid tripping and falling as you take your next steps, but you also see the gradual process of moving closer to your end point. As I run I find myself focusing on my steps, watching the pavement in front of me, and then lifting and adjusting my focus to my next marker point, which might be a few hundred metres in front of me, and then again, checking in with what’s immediately in front of me, to make sure I’m going to remain stable. This keeps me feeling secure and motivated when I run. I began thinking about how this applies to our everyday life. The focus we hold as we navigate our day-to-day life and working towards larger goals. Keeping a vision on the end point, the end goal, while ensuring we have a focus on what’s immediately in front of us, the small things, the day-to-day things. But…do we forget to look back up? We can so easily get fixed on the immediate visual field, the pavement in front of us, the daily hurdles, that maybe, we forget — that which we cannot always see, which is the end goal, the point that we are running towards. As I run, I know the importance of adjusting my focus, and I think the same concept is just as important for living a joy-filled life. Now I’m no tech expert, but there is a reason why cameras that allow adjust-ability for things like shutter speed and aperture, have high powered zoom, and high resolution, are the most expensive kind on the market. It’s because they provide the highest quality image. The most valuable picture. The picture we cannot see with the human eye alone. There is value is capturing a good quality image, but even more value in being able to capture different types of images with the same device. Images that have a different emphasis, a different focus, a focus that can change depending on the image you’re trying to capture. Applying these concepts to our field of vision, our sight, and our focus, is so important also. While you’re on this journey called life, make sure you’re taking time to adjust your focus. Spend time preparing yourself for what’s immediately in front of you, but don’t forget to look back up, redefine your goal, your marker, what it is that you are working towards, and don’t ever let that out of your sight. How can I ensure that I am constantly remembering to adjust my focus? Spend time dreaming. Think about your hopes and dreams for the future. This could be in the form of writing a bucket list, a vision board, having regular conversations with a like-minded friend, or any other creative way that works for you. It could simply be writing a list, or jotting it down on sticky notes around your office. However you do it, prioritise time for dreaming regularly. Write your goals down and make yourself accountable. Writing down your short-term and long-term goals helps you to identify where you are at right now and where you want to be. It also serves as a good reminder, when you find yourself stuck ‘looking at the pavement’. Balance your time between productivity and leisure. Now this is the occupational therapist coming out it me, but it is so important to ensure you have time to work on your goals, your dreams and your visions in a productive manner, but also allowing time to completely switch off, and do things that just make you happy, and not necessarily with any particular purpose other than making you feel good. Identify your values. Knowing what is truly important to you will help in knowing how and where to adjust your focus. For me, I wrote a list. I took the time to think about what my top values in life are, and I wrote them down in a place I can easily refer back to. Through this process, I learned more about myself, what I need to be focusing on more, and what is taking up too much unnecessary time and energy, leaving me feeling stuck. Moral of the story: know what your goal is, and get comfortable with the process of constantly adjusting your focus as you walk through the convoluted, ever-changing path called life.